Tufloc Vertical Mount Gun Rack FREE SHIPPING! As a tactical professional, secure and reliable weapon access is an essential part of the job. The Vertical Mount Gun Rack from Tufloc is a safe and dependable solution to vehicle weapon carry. 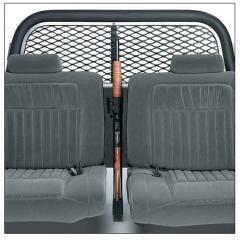 The mount is made of high-strength steel and is secured in a vertical position between the driver and passenger seats in order to offer rapid firearm access for either rider. Because safety is a priority, the lock is released with an eight-second delay timer or a key override. Each mount features a padded lining that both protects the weapon from damage and prevents irritating rattling. The lock fits any rack system and is compatible with all firearm models. ©2002-2019 CopsPlus.com: Tufloc Vertical Mount Gun Rack FREE SHIPPING!